We are nearing the end of a month spent in Austin, TX. I have loved it, though working in someone else’s kitchen has definitely been an experiment. My kitchen at home is almost as small as you can get- but it is fully stocked with just about every kitchen gadget as well as a pretty full pantry. I both feared and looked forward to leaving it behind. When we arrived in our temporary apartment (acquired on airbnb.com), we quickly headed over to inspect the kitchen. There were about 4 spices: curry powder, red pepper flake, cumin and cinnamon (some of my faves) and some pretty sad looking pans. There was a collection of wooden spoons and a spatula, but no whisk and no hand mixer. No need to panic – I’ll just have bitchin’ forearms from all the manual mixing by the end of this trip, right? Perhaps I’ll realize my new career as an arm-wrestling champ. Yes! 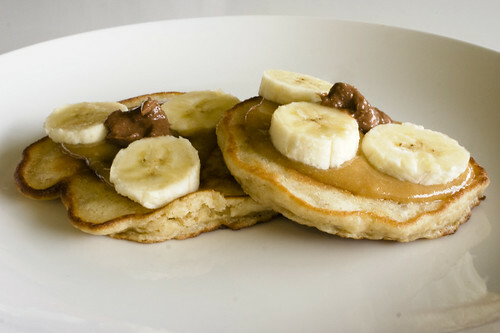 Or maybe I’ll just eat some real tasty pancakes… that’d be swell too. Aside from the oven smoking the first time we used it (clearly it’s not a frequently used device), we’ve done pretty well. There’s no toaster oven or microwave but there is a blessed dishwasher – something I don’t have at home. The only things we cracked and purchased were a coffee grinder, a milk frother (hey, I love my latte’s), a good chef’s knife and a knife sharpener. We’ve cooked anywhere between 1 and 3 meals a day, making everything from casseroles to soups to cookies to potatoes au gratin. It was interesting to learn what I could and couldn’t live without. It was also interesting to learn that one of said sad looking pans cooks pancakes *perfectly*- something that I always have trouble with using my nice shiny new pans at home. Is it the electric burners they have here providing a more even heat? The heavy weight of the pan? Whatever the case, I was happy. Another plus to cooking in Austin is that it’s the home of the world’s first Whole Foods, which means of course that the one here is a food nerd’s dream. At the start of the month we stocked up with lots of organic supplies – something I don’t always treat myself to. To my surprise, we went through the flour really slowly. I quickly made up for it by making a few batches of pancakes. The first time I served these oatmeal pancakes, I topped them with stewed apples because the pancakes are thick, filling and beg for a fun topping. Wanting to switch it up the second time around, I made a peanut butter maple sauce and chocolate butter, and topped them with chopped bananas. This trip has also been a lesson in how to make a variety of stuff with a limited pantry, which translates to: how many different ways can I use the same peanut butter and chocolate hazelnut sauce I brought with me? The answer: many! And all of them delicious. But now that the trip is almost over, the real question is: can this much peanut butter sustain us for 2 1/2 days? 1. Preheat your oven to 200°. Keep the prepared pancakes warm in the oven while you prepare your toppings. 2. 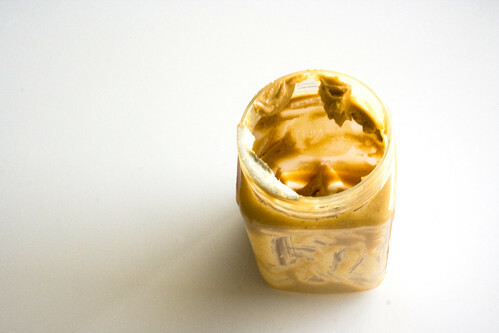 For the Peanut Butter Maple Sauce, mix the peanut butter, maple syrup, honey and water until blended. 3. For the Chocolate Butter, mix the butter, chocolate hazelnut spread and sugar. Note: If you don’t have a microwave, the patience to wait for butter to soften, or a whisk, chop the butter into small pieces. Stick a fork under a stream of hot water, dry it off quickly with a hand towel and mash the butter pieces. Add the chocolate hazelnut spread and sugar and mix until blended. 4. 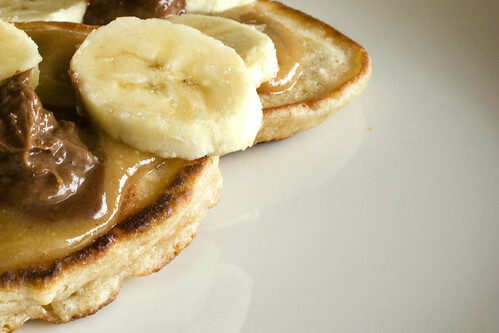 To serve, top the warmed pancakes with a smear of the Peanut Butter Maple Sauce, a dollop of the Chocolate Butter and some sliced bananas. Enjoy!